You’ve made your travel plans, picked out your Thanksgiving outfits (hello stretchy pants and loose dresses), and you’re already daydreaming of pumpkin pie. But while you’re brainstorming a list of things you’re thankful for, don’t forget about your skin! November and December mean holiday travel and holiday stress, and even if you have some time off from work or school, your skin never rests. A few hours sitting in a car or on a train or plane are enough to leave your skin feeling bloated, dry, and ready to freak out. Don’t fret! We had our founder Dr. Sandra Lee (who you probably know as Dr. Pimple Popper) answer some questions about how to prevent your skin from self-sabotage! Q: How does crazy travel for Thanksgiving affect skin? Dr. Sandra Lee: Travel can really dry out our skin. Especially airplanes because of their air-conditioned air. Also, when we travel long distances and endure a change in weather — from dry to humid or hot to cold or vice versa — this acute change in the environment can make our skin suddenly oilier or drier, and increase our propensity for breakouts. Know ahead of time the type of environment you’re traveling to… it’s as simple as checking the weather app on your phone. Dry climate means switching from a moisturizing lotion to a moisturizing cream… lotion is typically water-based whereas creams are oil-based, and that means that creams are richer in emollients and more moisturizing. Vice versa if you are traveling to a more humid environment. If you’re looking for a great hydrator & moisturizer in one, check out the SLMD Skincare Hyaluronic Acid Serum to add to your travel routine! Anywhere you go, though, remember to wear sunscreen! The SLMD Skincare Daily Moisturizer with SPF 15 is a great option for wintertime, it’s a two in one moisturizer and sunscreen and won’t feel heavy or clog your pores. Q: If we do get a zit, how should we treat it? Any tips on how to avoid pimples in the first place? Dr. Sandra Lee: In case you get a pimple, it’s great to bring an acne spot treatment (like SLMD x Dr. Pimple Popper Acne Spot Treatment or SLMD BP Spot Treatment) with you to have for zit emergencies — they’re super convenient to carry onto the plane. If you’re traveling on a red-eye or sleeping for a long time on the plane, consider washing your makeup off before you sleep, just as you would at home. If your skin gets oily easily, consider bringing blotting paper with you on your trip to help soak up extra oil on the spot. 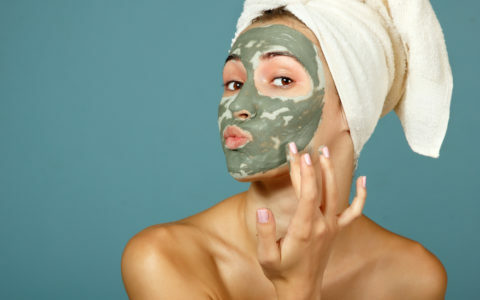 When oil sits on your skin it can clog your pores, which can lead to pimples! Q: How about overeating or lots of drinking… does that affect your skin? Any tips for keeping skin clear? Dr. Sandra Lee: If you’re dehydrated, your skin can look sallow and unhealthy, so make sure to stay hydrated. But avoid an excess of lemon in your water, this won’t help keep your skin clear. Actually, an excess of acid in your gut can only cause more heartburn or stomach discomfort during your journey. Also, greasy food only causes acne if you rub it all over your face… so of course, avoid doing THAT! If you overeat, this usually means a big nap, so if you are going to curl up, remember to wash off your makeup, this will help prevent a breakout! SLMD Skincare makes super handy Cleansing Wipes for taking off makeup, dirt, and any other grime that accumulates while you travel! Thanksgiving usually comes with a side of family drama… any tips for managing that? Dr. Sandra Lee: Oh, I don’t know if I can help there — that can be unavoidable! I say, try to stay out of it as much as you can, or consider bringing your headphones and listen to some relaxing tunes! Stress can exacerbate many skin conditions including acne, so avoid the drama as much as you can!